CORTE MADERA, Calif. -- Drive a few minutes one way from Jaguar-Land Rover-Volvo Marin, and you'll arrive on an idyllic shoreline with a view of the Golden Gate Bridge. Drive a few miles the other way, and you'll find yourself among the redwoods of Mount Tamalpais. Jaguar-Land Rover-Volvo Marin, which does a brisk business supplying vehicles to the wealthy lovers of the great outdoors who live here, also offers regular doses of California fun to its employees, ranging from lunchtime visits by a taco truck to off-road driving excursions and spirit days on which employees wear the colors of local sports teams such as the Golden State Warriors. Beyond those special events, the store has sought to build a culture in which great work is recognized every day and employees get enough time with their families. That culture has resulted in the dealership being rated No. 1 among medium-sized dealerships in this year's Automotive News list of Best Dealerships To Work For. Medium-sized dealerships are defined as those with 50-99 employees. 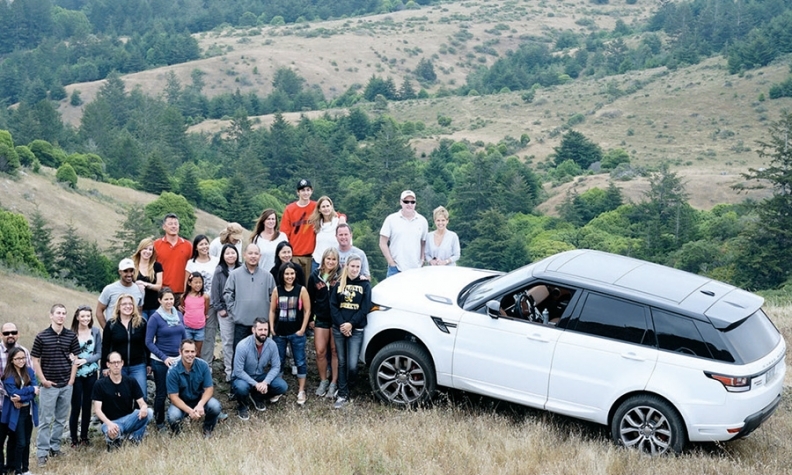 Jaguar-Land Rover-Volvo Marin makes an effort to get employees and customers out in the California sunshine and off road. It all starts with General Manager Nick Price, who has a personal goal of interacting with every employee every day and giving out three handwritten notes a week to people who have made a difference. Managers also give out gift cards to Southwest Airlines and Peet's Coffee to employees who take the initiative to help customers or the business. "Once people feel comfortable with you, they'll tell you exactly how they feel," Price told Automotive News. "And once people start telling you exactly how they feel, you can change things to make the place even better." Jaguar-Land Rover-Volvo Marin is part of Price Simms Auto Group, founded in 2003 by Nick Price's father, Tom Price, and business partner Adam Simms. Price Simms owns eight other stores around San Francisco Bay, running the gamut from mass-market Ford and Toyota to high-end Mercedes-Benz and McLaren. The company jumped 26 spots to No. 77 on Automotive News' latest list of the top 150 U.S.-based dealership groups, with retail sales of 11,664 new units in 2014. Despite being part of such a large dealership group, Jaguar-Land Rover-Volvo Marin is dedicated to making individual changes based on the results of employee surveys. The most recent survey prompted the store to invest in a new machine to keep track of keys, replacing a system that was nearly 20 years old and had a slew of burnt-out electronic ports. Managers had intended to get a few more years out of the old system to spare the $25,000 cost of replacing it. But when a survey showed the device was a constant frustration for employees, they decided to invest in a new system this fall. Jaguar-Land Rover-Volvo Marin has also refrained from extending store hours, even with many other stores in the Price Simms family staying open later and later. The shop is open from 7:30 a.m. to 6 p.m. on weekdays; the showroom is open from 9 a.m. to 6 p.m.
"I've found that we may miss out on 5 to 10 deals per month," Nick Price said, "but it makes it way easier to staff the store. Everyone is at home with their families by 7:30 and that makes people so much happier overall." Staffers show their spirit during the Golden State Warriors' NBA championship run in 2015. Jaguar-Land Rover-Volvo Marin is full of sports fans. 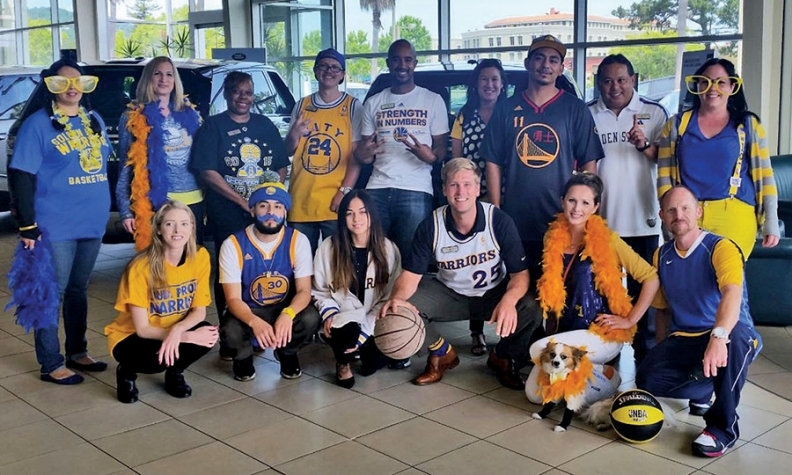 So this spring, when the Golden State Warriors were making a run to the NBA championship, the store's employees were encouraged to dress up in blue-and-gold Warriors apparel, with $100, $50 and $25 prizes going to the most spirited employees. About two-thirds of the staff participated. The store also makes an effort to help its employees enjoy the California weather. 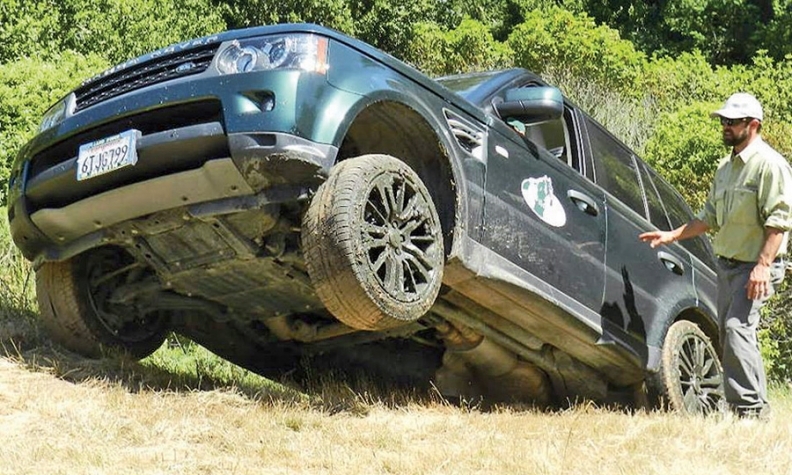 Once a year, it hosts an off-roading trip in Bodega Bay, an hour north along the California coast, with 20 customers, 10 to 15 employees and used Land Rovers. And every month, a food truck sets up shop in the parking lot. Employees get tacos and birthday cake, while business goes on as usual. "We trust our people to take responsibility," Price said. "They know what they need to do, even if they're running around with a taco."